The best dedicated online bingo sites will reward their loyal bingo goers generously. When choosing where to play Internet bingo, make sure you assess the quality of the promotions, rewards, loyalty programs and birthday bonuses offered by the bingo provider. It’s common among the major bingo websites to give every registered player a bonus on their birthday, but what’s given out can vary greatly from site to site. Here are some of the top birthday bonuses out there on the Web. Aussie Dollar Bingo has Star Sign Bingo that rotates between the different star signs every month. Any Aussie Dollar Bingo member can play Star Sign Bingo regardless of whether you’re the current star sign at not, but if it is currently your actual star sign you have exclusive access to the $200 Free Roll Star Sign Bingo which means you can have a piece of the $200 prize pool without paying a cent. This Free Roll game is held on the first day of each new star sign, and invitation for your special star sign game will automatically be sent to your account. The site also has a great Loyalty Rewards Program, which reimburses you in a number of different ways. There are different levels on the program each of them allocated a different colour. Regardless of what level of the Loyalty Program you’re on you will still receive some sort of birthday bonus. If you are a Yellow, Orange, Green, Blue, Purple or Crystal level member you get a free $20 on your birthday. If you’re a Red member you get $40 and if you are a Black member you get a free $60 birthday bonus. Bingo Australia is Aussie Dollar Bingo’s sister site, so its Loyalty Program and birthday bonuses are virtually the same. 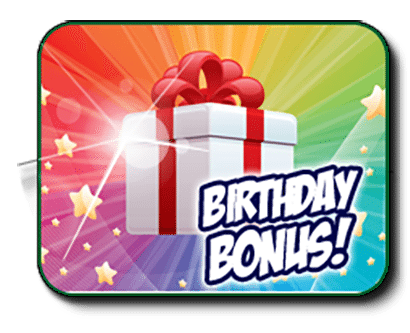 If you want to be on a higher tier of the Loyalty Program so that you can get higher birthday bonuses all you need to do is make more real money deposits. If you’re naturally a regular bingo player this won’t be hard to do over time. If you’re a Crystal level member or higher you’ll also get an Anniversary Bonus to commemorate the day you signed up with either Bingo Australia or Aussie Dollar Bingo. The Anniversary Bonus will give you up to 300% for free back on your deposit. Kitty Bingo also gives away generous birthday bonuses as a part of its loyalty rewards program called Kitty Club. There are different tiers of the Kitty Club, and how high up you are determines what birthday bonus you’ll be eligible for. When it’s your birthday, Bronze members will get $5, Silver members will get $10, Gold members will get $25, and Ruby and Emerald members will get a free $50. Only Newbie members won’t be eligible for a birthday bonus however once you’ve signed up to Kitty Bingo it doesn’t take long to progress from Newbie membership to Bronze. Lucky Pants Bingo is Kitty Bingo’s sister site, so again it gives out birthday bonuses in a similar way however instead of being a part of the Kitty Club you’re a part of the Lucky Club. In addition to getting higher birthday bonuses if you’re higher up on the tier of the Lucky Club you are also given more daily free cards, more daily free spins on its slots games, shorter withdrawal pending periods and a higher Cashback For Life rate (this is where a portion of every deposit you make is given back to you in cash, Bronze members get 5% while Emerald members get 15%). All of the bingo sites we’ve selected are also great bingo providers all round. They have a great selection of fun bingo variants, safe and secure banking methods and other casino games, as well as excellent birthday bonuses. To check out more of the birthday promos on each site and sign up for account, click or tap on any of the images on this page and you’ll be re-directed to the best Australian online housie on the Web.